If junk food is so bad for the body and bad quality overall, why is it so popular? You'd think no one would touch it. First, let's back up and define "junk foods." It's the stuff you eat that has little to no nutritional value, usually combined with ingredients that are bad for you, or is high in calories when consumed in excess. So that means candy, chips, cookies, cake, sugary soft drinks, greasy burgers, hot dogs, French fries, ice cream, and most things that served at fast food restaurants qualify as junk foods. 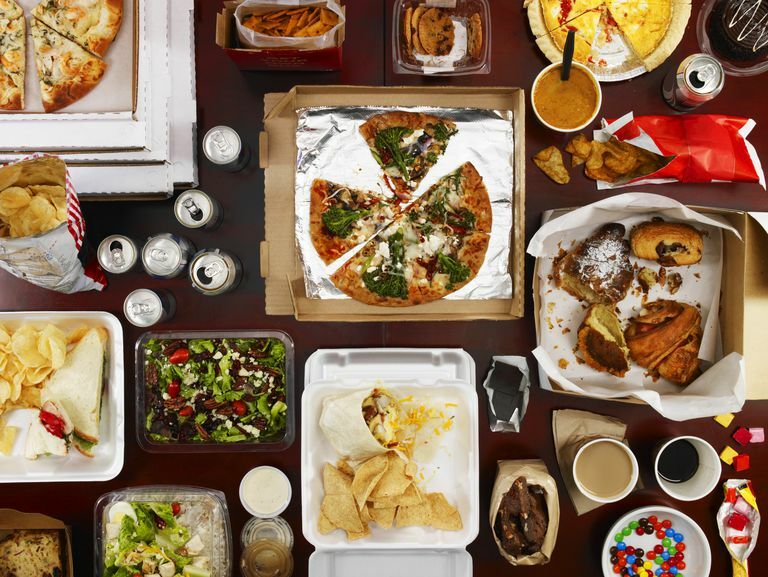 So, why do so many people eat junk food? Here are three likely reasons why junk food is so popular despite the fact that we know it's not the best choice for health and well-being. Junk food is popular is because most of it is inexpensive. You can go to most any fast food restaurant and order something off a dollar menu of some sort. If you have a few bucks in your wallet, you can buy a full meal. It's no different at the grocery store. Cheap snacks, inexpensive high-sodium and high-fat meals can be found on the shelves. Healthier foods—like fresh fruits and vegetables—tend to be pricier. Bags or cups of instant ramen noodles cost less than 50 cents, whereas an orange costs a dollar. Although a lot of junk food is cheap to buy up front, the argument can be made that cheap junk foods end up being more expensive in the long run due to their negative impact on health. Junk food is lurking in vending machines and convenience stores. Even establishments that don't typically sell food items might have snacks and sodas near the cash register. And those instant meals previously mentioned? They're easy to prepare, and you can stockpile them in your kitchen cabinet for a long time. Of course, fast foods live up to the name. You can order a fast food meal and then eat it a minute or two later. Or you can order your meal from your car to can save time by wolfing it down while you drive away. That drive-thru thing isn't good, though. Not only is the food bad for your health, but dropped fries can accumulate in your car, under the seat. And that gets kind of gross. Rarely do junk foods tempt you with delicate or complicated flavors. They pretty much hit you hard with sweet, fatty and salty flavors. Simple flavors might be preferred by people who are picky eaters—it could be the slightly bitter flavor of many vegetables turns some people off, especially kids. But it's more than flavor. Various combinations of sugar and fat make for textures people like. Fat makes foods feel smooth and creamy, like ice cream. Starchy potato and corn chips cooked in hot oil have a satisfying crunch. That's not to say that healthy foods don't have a nice texture, but sometimes the textures of fresh fruits and vegetables take a little getting used to. Because junk foods are easy to find, easy to make, and a lot of them just flat out taste good, consuming them becomes a habit. That's the real problem. Eating a candy bar every now and then or snarfing down a bag of fries on rare occasions isn't that big of a deal. But when you crave junk foods, and they make up a big part of your daily diet, then you run the risk of becoming overweight and obese, plus you're not going to get enough of the nutrients and fiber your body needs for good health. So, next time you find yourself standing in line at a burger joint or staring at a vending machine, think about how your choice could affect your health. Then walk away and find something better. Do Brussels Sprouts Have a Lot of Calories and Fiber?